Leave Level Design Tips back to Home Page.. The world of Level Design.. This section will be covering the basics of level design to some newer advanced prototype stuff I've been working on recently, so if you're a beginner or a veteran there should be something of interest to see! 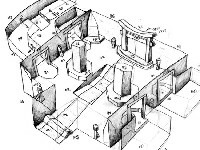 Basic over-view on Level Design and the difference between a level designer and a level scripter. A good way to learn Level Design, the process of De-Engineering. How to create the structure and flow for your level..
How to place objects and enemies in levels..